Hello dear followers, sorry for the delay between posts but I've been busy trying to make the most of the weather which until now has been quite pleasant for the time of year. So let's catch up with what's been happening of late. Fame at last (well almost). Well, not quite, but just as good. Not so long ago, the editor (Ben Heather) of the Suffolk Naturalists' Society magazine, White Admiral, contacted me asking if I would be happy to write a piece on the benefits of social media to the naturalist. Needless to say I was honoured and more than happy to oblige. Well, it was published a couple of weeks ago and I feel quite chuffed. I'm already writing my next piece the the magazine, although, won't know yet if it'll be good enough to be published. I could get the hang of this columnists thing. In the meantime, if you fancy joining the SNS or want to buy membership for a friend as an Xmas gift, then go to their website to find out more details. I saw my first one of the year in my garden the other week. Unfortunately, it wasn't a White Admiral (Limenitis camilla) but a beautiful Red Admiral (Vanessa atalanta). Yes, just another visitor to my flourishing buddleia which has had so many visitors of late, that I'm surprised it hasn't run out of nectar. I stood in front of it the other day and counted ~25 butterflies on it (19 were Small Tortoiseshell's). There were many more bees and hoverflies as well, just too many to count and all this was on just one side of it as I can't see what's happening on my neighbours at all. Most of the butterflies on it these past weeks were Small Tortoiseshell's (Aglais urticae), in abundance and some Peacock's (Inachis io). 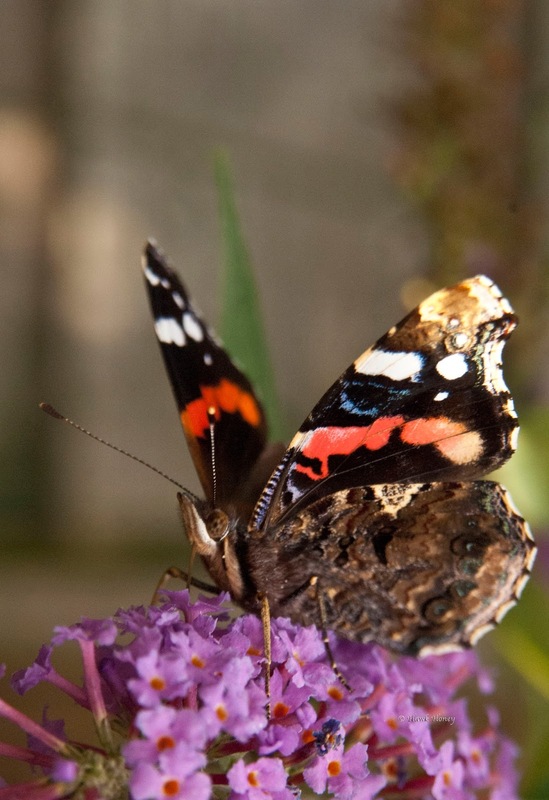 The Buddleia has been a focal point in my garden this year with many butterflies, moths, bees and other insects making great use of this valuable nectar resource. Every now and then though, I would find a dead bumblebee laying on the patio beneath the bush and as you may know, owning a microscope, I would collect these to have a closer look. I've also learnt how to pin insects this year and I decided to collect these dead bumblers every time I found one and pin it. The end result has culminated in this little display. on one planet, in... (I could go on forever). Already, I've had a few nay sayers questioning my ID'ing of these bees as it is very hard to tell in the field, the difference between Buff-tail (Bombus terrestris) workers and White-tail (Bombus lucorum) workers as they both look the same. However, the queens do not and the white/buff tail is fairly obvious between them and as many of you may know that I've been lucky this year in having these bumblers nesting under my pond waterfall opposite the Buddleia. I was even luckier to see a new queen leave the nest and land straight on the buddleia opposite, where I could clearly see the buff-tail which gives it its name. Anyway, this little collection is for my own benefit only and to show any kids if I'm asked to do a school show and tell again, so it's no real biggy if I'm wrong, even if it's only slightly wrong. Me and the wifey went on a little walk the other week where we came across this unusual looking tree. Wifey examines the split tree. At some point in its early life, it had split apart and continued to grow this way until it joined together again at about 8ft high. I love little oddities like this in nature, it's just another facet of what makes nature so intriguingly fascinating. We also came across a bee hive up high in a tree, but due to weight restrictions (I cannot carry anything heavy, doctors orders) I didn't bring my big lens out with me so was unable to get a decent enough shot. But it was still an interesting thing to see, watching the hive of activity as the bees went back and forth in and out of the hole in the trunk. Yes, the weather men and women were all saying it, that it was going to be the last day of summer as far as the weather was concerned, with temperatures expecting to hit the 30ºC's! So I thought that I would make the most of it and get up early for a nice sunrise walk. I chose to go to Newbourne Springs, a nature reserve I found this year and also done a butterfly count there where I saw no less the 105 butterflies in just 15 minutes. It's only a 10 minute drive from me too, so not too far for me to travel, which is a bonus in my current situation. 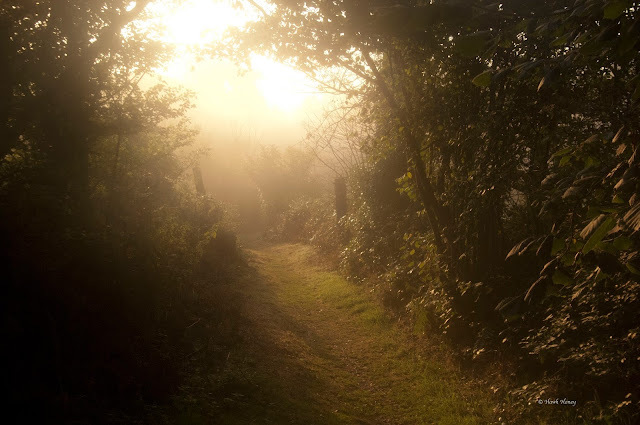 The mist was heavy in places when I arrived with spiders webs all glistening with dew. The place was still and silent and an ideal place to be when reflecting back on the summer that's just been. I only came across one human walker as it was quite evident that it was the dog pulling the not so eager human along instead of it being visa versa. The first thing I noticed was that there had been some clearance of vegetation, quite a lot of it in fact. It's this sort of thing that I often struggle with. It's called a nature reserve, but yet, the nature within it has to be managed. Why? Why just not leave it to manage itself? As long as you can keep the pathways clear, let the nature within the reserve get on with managing itself. After all, what happened before mankind came on the scene? Who chopped down the large swathes of rushes and nettles then? And surely, within those large dense beds of vegetation, there must be many overwintering insects and creatures who rely on this sort of habitat? I wonder if Suffolk Wildlife Trust would be willing to undergo an experiment in re-wilding to see what would happen? I for one would like to see something like this happen. Anyway, I digress. Due to the vegetation destruction, sorry management, I took a wrong turn, simply because I didn't recognise the place. 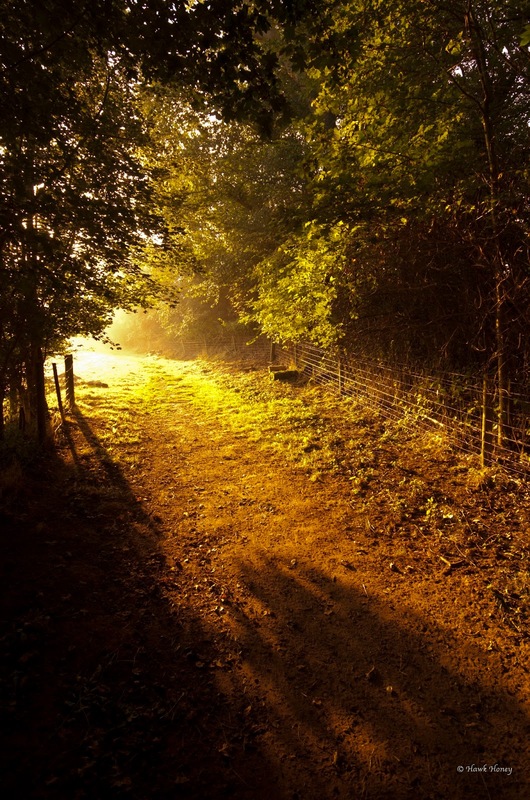 However, I soon realised and continued down my erroneous path to see where it would lead me. 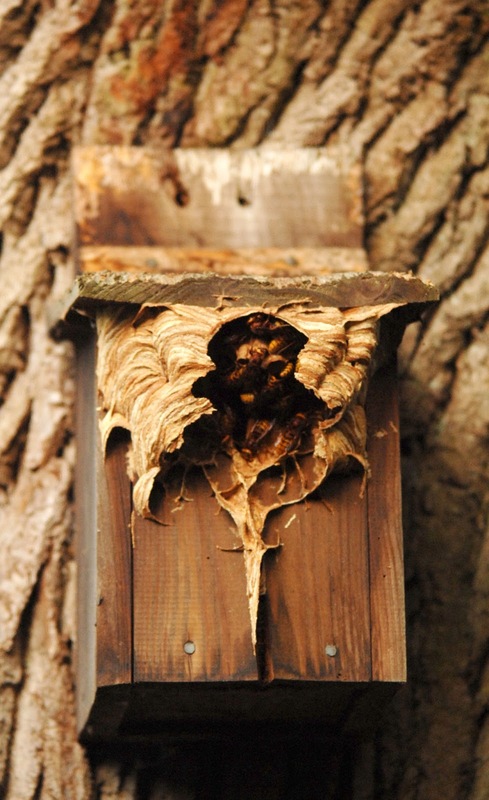 I then came across this bird box that did not house birds, but instead a family (if you can call them that) of Hornets! This is the first hornets I've seen in this country this year and the first ever hornet nest I ever seen. Although I was only a few feet away from them, I remained a respectful distance from them as I know hornets to be highly intelligent and very aware. They even post workers to stand on guard duty around the nest and attack anything that comes too close, so I wasn't taking chances. I was just happy to stand there and watch and listen, because the sound that emanates from the nest is quite loud and is of constant chomping. I would love to go back and have a closer look when the hornets have all gone. There wasn't much else too see wildlife wise on this beautiful morning, or maybe it was because I was in a different head space to be truly aware of the things going on around me. But I was captivated by the beautiful mistiness of my surroundings. It wasn't long before I had completed my circular walk and found my way back to the start. On the way home, I thought I'd pop in to Purdis Heath to see what I could find. The sun was well and truely up by now and the heather was looking lovely with bees buzzing around visiting all the tiny little flowers that heather produces. 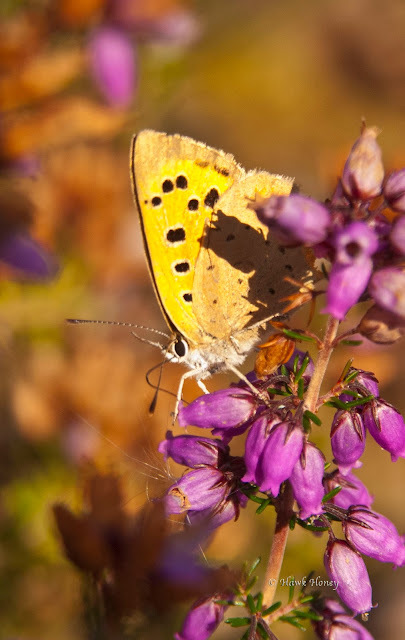 I managed to grab this quick shot of a small copper (Lycaena phlaeas) also grabbing a quick drink, but it wasn't hanging around for pictures I'm afraid. Again, this site has been managed, but I can understand why in this instance. Purdis Heath is just that, a heath. It's through human encroachment that deciduous trees have begun invading the heathland site and changing its ecology from heathland to woodland. This is not good news for the various insects that have used this environment for millennia. So, due to many volunteers under the guidance of Matt Berry of Butterfly Conservation, the trees are chopped down and converted into dead hedges for wildlife. They still have a long hard battle on their hands and I'm sure Matt is welcome for more people to come on board and help out over the winter months. Purdis Heath in full bloom. I soon found myself heading for the cover of some of these trees to get out of the heat of the morning sun, so harsh it was. It was I noticed a pair of dragonflies hawking around catching flies from the air then returning to a protruding twig to either devour their prey or look out for the next unfortunate victim. I love these creatures, so prehistoric looking and so very aware of their surroundings. I say prehistoric looking, yet these creatures flew around our prehistoric planet at the same time as the dinosaurs. Fossil records show them with wing spans nearly a metre wide (75cm to be precise). Can you imagine that? Awesome. The reason they don't reach that size now is due to the atmosphere. Then, when the dinosaurs walked the Earth, there was much more oxygen in the atmosphere than there is today, allowing for creatures to grow much bigger. But even though today's dragonflies are small in comparison, they're still just as wonderful. An old female Common Darter (Sympetrum striolatum) in the late afternoon sun. As I mentioned earlier, they are very aware of their surroundings and they were very aware of me approaching them to get their picture. I had to move in very slowly so as not to scare them off. I suppose that it's down to their agility in flight and their quick responses that make them quite relaxed when it comes to someone taking pictures of them. I remember about 10 years ago when I used to live on the broads. One day whilst sitting on the front of the boat reading the paper, a Broad-bodied Chaser (Libellula depressa) landed on my knee. I was amazed to be able to look at this wonderful insect so closely and it was quite aware of me as it turned its head to look in my direction. It then amazed me more by taking off from my knee, flying up about a metre, grabbed an inflight fly and flew back down to land on my knee and finish its meal, absolutely stunning. So, yes, they are very aware of their surrounds and as proved, very agile in flight too. 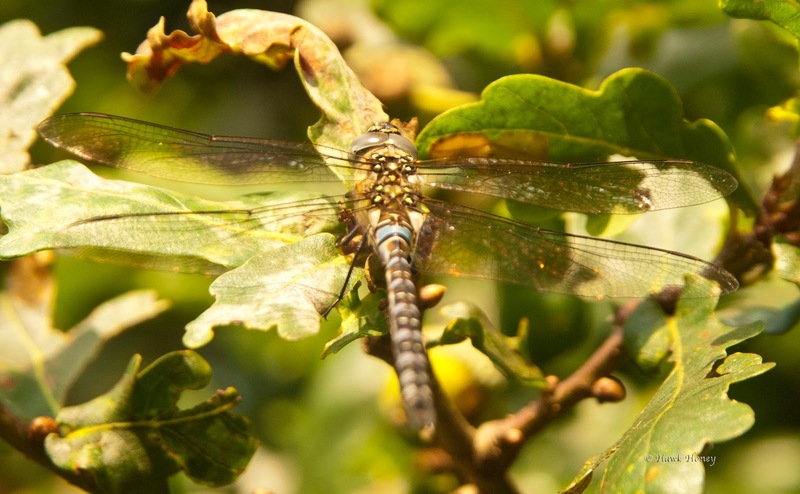 I walked a bit further on and came across another dragonfly, this time a male Migrant Hawker (Aeshna mixta) hawking around one of the oak trees. From behind and below, unfortunately. Unfortunately for me, he's resting place was about 2 feet above my head, so I was unable to get my camera into an appropriate position to get a good picture. So, sorry, this is the best I could do with this one. He soon got fed up of me, and then I noticed on a leaf near to where he was resting, a small caterpillar. On closer inspection, it turned out to be a moth caterpillar of the Grey Dagger agg species. 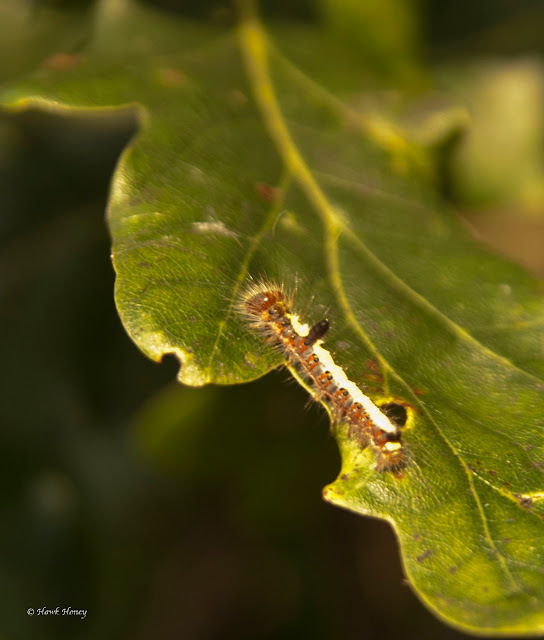 Acronicta sp caterpillar. That black protrusion is supposed to be there. When I got back, I saw a message from my neighbour that said he still had tadpoles in his pond. I was amazed to hear this and wondered what was going to happen to them come the onset of winter. So without further ado I Tweeted the Amphibian and Reptile Groups UK (@ARGroupsUK) about this and they sent me a link (which I will share with you) that explained the matter of late developers in full. For those who are not bothering with the link, I'll tell you. It's all about food and survival it seems. If there isn't much food in the pond, a tadpole can decide as early as early summer, that it will overwinter in the pond and emerge next year. This is a better survival strategy than emerging from the pond undersized. I remember Jacob (Beetle Boy) covering tadpoles on his blog and mentioning that they could control their metamorphosis, but I didn't realise they could actually drag it out that long. So, if you, like my friend Mick, also have tadpoles in your pond, fear not, they'll be OK.
Have you noticed this year of the various companies springing up, offering wildflower seeds rolled in to seed balls mixed with soil and other stuff that you can carry in your pocket or car, ready to be lobbed into any area that lacks enough colour for your eyes. There adverts appear in many nature/environment/ecology magazines and across social media sites. Are they providing a beneficial service for the environment, making matters worse, or just making a quick buck off the green wagon? Are the seeds being used, native? This must be the first question. And when I say native, I mean native to this country? It's all very well throwing a little ball of clay into a field margin thinking this'll help the birds and the bees. But if that little ball ends up containing some foreign species of plant that has no known predator in this part of the world, then what you could have done is sow the seed of a mini (possibly more) environment catastrophe! It sounds a bit dramatic, but when you're an insect that's only 1cm long, the field edge is a huge place to be and an invasive plant could swamp that area in no time killing all the true native wild plants in that area. What seeds are actually in those little packets? OK, so you've checked and the company says they only use native seed, bonus. However, here's the but. What if the seed may be native, but isn't actually common in the area you're dispersing it in to? What then? What impact are you having on that small little ecosystem that has thrived on the organisms within it and now has to deal with a foreign (in area terms) invader. Imagine Purdis Heath (mentioned above) but on a much smaller scale. Some companies use chilli powder in their mixes to deter predators from munching the seeds. But hold up, isn't that the whole part of nature? Some things get eaten, some are lucky and get missed. Already, the giving nature a helping hand ethos that the companies use is put into question by deterring nature's predators. I once attended a talk by Professor James Hitchmough. He was the man responsible for the planting of the Olympic wildlife park at Stratford, East London. In this talk, he explained the research and the trouble he and his team went to in making sure everything grew and most importantly of all, flowered at the right time, the opening of the Olympics. Part of his talk explained the process in getting seeds to germinate and, to cut a very long story short, it seems that if you happened to obtain the very best seed, the best expectations you can have is 30%. That's 30 seeds germinating for every 100 planted and that's top grade seed. Do you really think you're getting top grade seed when you pay a couple of quid for several hundred, possibly thousand, seeds?? I doubt it. But everyone else hears the 'Being green' type tagline and they're digging into their pockets for that spare couple of quid to buy what exactly? A packet of seeds that are mostly dead. Makes you wonder, doesn't it. I too have tried some, and thrown half a dozen little spheres around my garden at the start of the year and I am still waiting to see something grow and now that autumn approaches, I think that's it's unlikely that anything will ever grow. In my opinion, the best thing you can do is not give your money to these companies, but spend the money on nectar rich plants for your gardens. If you view our towns and cities and even our countryside from the air, you'll see that for an insect, it's a barren place out there. By making sure your garden is well stocked with lots of nectar rich plants that give all summer long, then you'll be spending your money much more wisely than using it to throw a blob of mud into a hedge never to be seen again! All in all, we've had a lovely summery summer. The weather has been more summer like this year than previous years, the wildlife has been abundant and as per usual, I've learned so much more. I've met some wonderful people in the course of my studies and had some wonderful experiences too. I hope that you too have had a lovely summer and enjoyed what our wonderful diverse countryside has to offer. I speak as if this is the end, but it isn't. As the chillness of autumn approaches, I look forward, ever forward to learning and experiencing so much more and sharing those experiences and learnings with you, my dear followers. So stay with me folks and lets ride together into the autumnal chill of nature. Till next time my friends, take care. Very full and interesting blog Hawk.Some good points regarding the seed balls. Imagine something like Japanese Knotweed seed being in them!.... I'll have to take a trip to Newbourn. Didn't know there was a nature area out there!